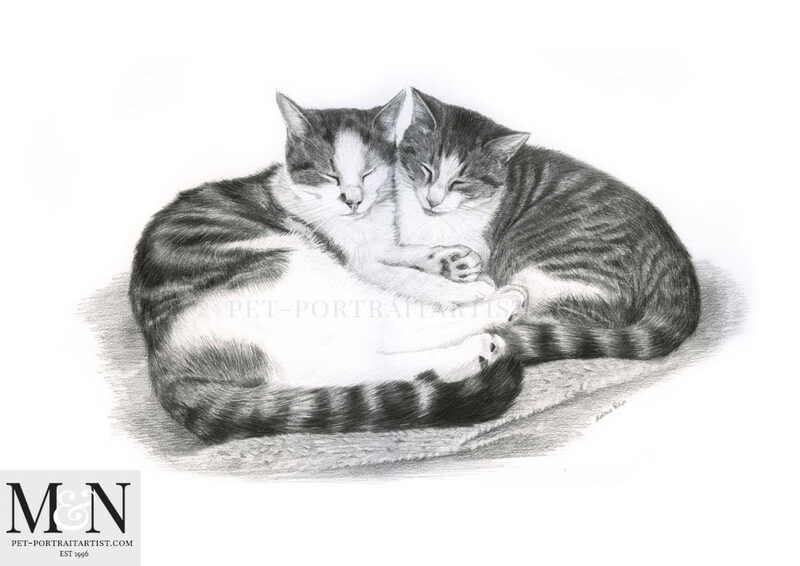 Welcome to my latest cat pencil portrait of Apache and Lynx. My client Chris contacted me a few months ago enquiring about a portrait. 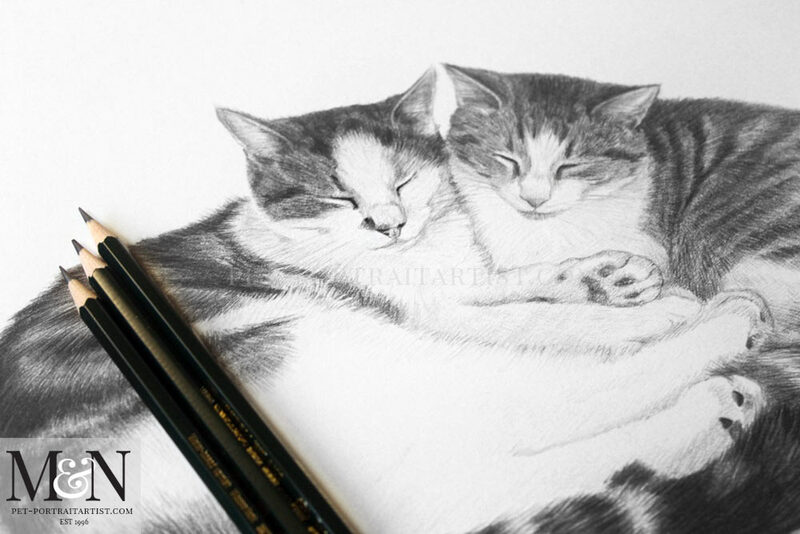 He asked if I would be able to complete a 16 x 12 pencil drawing of their cats for his partners birthday in September. The portrait was to be a big surprise and I spoke to Chris on the phone while his partner was out. It was very hush hush! We arranged that after the initial telephone conversation and a few iMessages, that we would mainly converse via his mum. So thank you Mary for helping! Mary, Chris’ mum, emailed me all of the photos they had of both cats. Sadly one of the cats had passed away. Having looked through the photos in detail the cats had obviously been very close. I realised that it would be best to have both cats interacting together in the same portrait rather than two head studies. Chris had the perfect photo of them cuddled up together. I very much enjoyed drawing both Apache and Lynx and you can see the final scan below along with a lovely message from Mary. Portrait arrived safely and is beautiful. I am sure when Chris gives her the portrait she will be delighted. After seeing I am thinking about getting you to do one of our dog Ellie sometime. Scans don’t really do my pencil drawings justice, so I have taken a few candid photos of my pencil portrait. The drawing was completed on hot pressed watercolour paper using a range of Derwent and Faber Castell pencils. You can see three of my pencils below. Artists often email to ask about my materials and so this year I wrote a page on my website showing photos of my favourite pencils, erasers, sharpeners and paper. 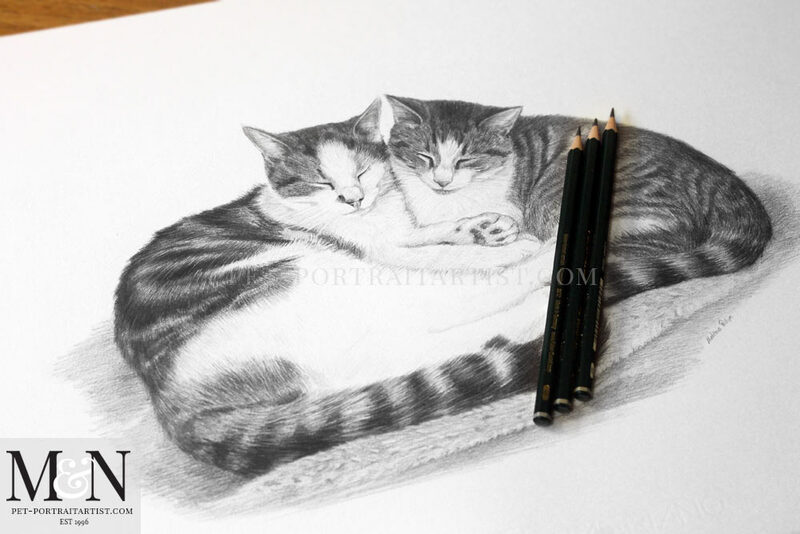 You can check it out on my pencil drawing materials page if you are interested! One of my favourite frames of 2018 is the Madison Slate frame. My framer Amanda offers two versions of the Madison. This is the slate version and we also have a Madison Taupe which is a kind of mix between silver and gold. Amanda couples the Madison Slate frame with a lovely double mount. The inner mount has a dark grey and the outer mount is our usual Hayseed which is textured. I just love the combination and the dark grey brings out the drawing beautifully. 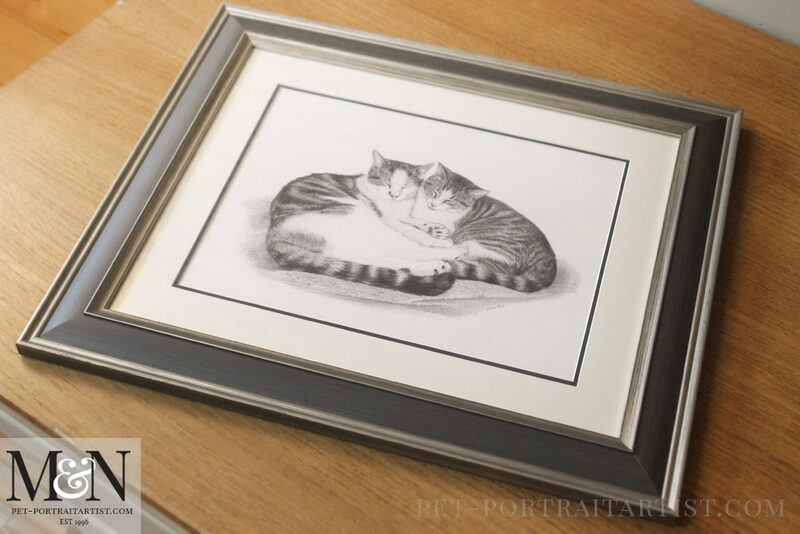 If any of our pencil drawing clients would like to opt for the Madison Slate, just let me know. I have two other portraits coming up soon using them so keep checking back! 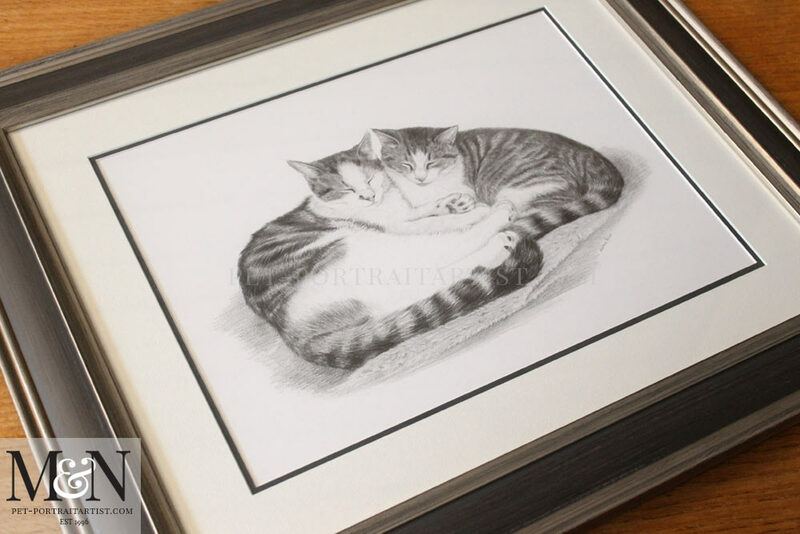 I really hope you have enjoyed seeing the cat pencil portrait of Apache and Lynx and if you are interested in having a drawing of your cats, why not drop me a line from my website at any time – contact Melanie Phillips for a pencil portrait!